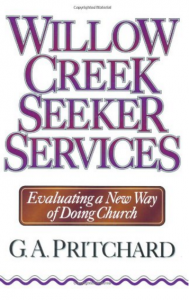 For those who see church methodology as biblically neutral, this 1996 book may be a source book for using market driven techniques. For those who see church methodology as a reflection of who we are in Christ, you may not want to waste your time with this book other than to gain an understanding of the Willow Creek history and philosophy. Pritchard studied Willow Creek as a doctoral study at Northwestern University. He claims to have a neutral approach but goes to great lengths to chide those who are reading with a critical spirit or “perverse” motivation. The first part of the book is a defense of his defense of Willow Creek. Pritchard observes that Hybels dropped out of Trinity Seminary after two years to implement a philosophy of “doing church” according to his mentor and continuing advisor, Dr. Gilbert Bilezikian, a dissident professor at Trinity. The philosophy is an outgrowth of the Jesus Movement which recruited young people looking for a cause within their own culture. It was simply adapted for an adult level.